This cake recipe has a lovely texture and a deeply chocolate taste and is one of my favourites. Although I have made it here in a heart shaped tin with a nod to Valentine’s Day, it can also be made in a round tin for any occasion. You will need a heart tin measuring approx 18cm (7inch) across, or a deep round tin measuring 18cm (7inch). A large piping bag and star tube. A thin cake board is also useful. Line the tin with baking parchment. Heat the oven to Gas 4, 180C. Melt the chocolate in the water and allow it to cool slightly. Cream together the butter and sugar until light. Beat in the egg yolks and essences, then the cooled chocolate. Fold in the flour and almonds. Whisk the egg whites until stiff and fold them in using a large metal spoon. Put into the tin, hollowing slightly in the centre and bake for approx. 50-60 minutes or until firm in the centre. Turn out onto a cooling rack and leave until cold. Butter icing: mix the cocoa with the boiling water. Beat together the butter icing, icing sugar and the cooled cocoa mixture with the vanilla and brandy if used. Put 2 tablesp. into the piping bag. Cut the cake across in half and sandwich the halves together with one third of the butter icing. 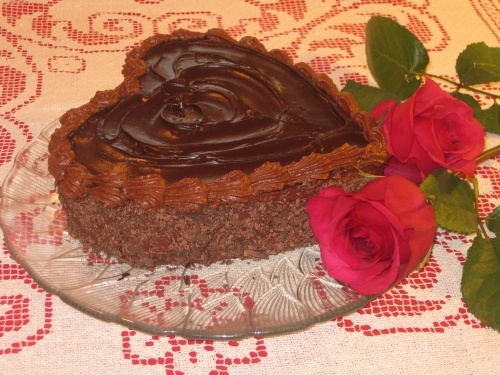 Spread the remainder around the sides of the cake and press the grated chocolate on it. Top: melt the chocolate with the butter in a bowl over a pan of hot water. Cool slightly then spread it over the inverted cake to coat the flat base. With a palette knife mark a pattern in the chocolate. With the reserved butter icing in the bag, pipe shells or stars around the top edge.